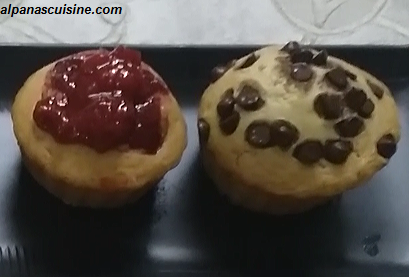 Eggless Muffins is very tasty and easy to make.We can add wheat flour in the place of multi purpose flour to make it more healthy.We can add choco chip or strawberry sauce to make it more tasty.Try this eggless spongy muffins,specially kids will sure like it. Sieve flour three times with 1/2 baking powder,1/2 baking soda and salt and keep aside. Now in a bowl beat sugar and curd and mix well.Add remaining baking powder ,baking soda ,vinegar and vanilla essence and mix well.Leave for 5 minutes. Then slowly mixed sieved flour in the batter.Add milk to make smooth batter. Now greased the muffins tray and pour the cake batter into it. Garnish with chocochip and strawberry sauce. Bake at 180 degree celsius at lower rack for 20 to 25 mins at convection mode.